VA Says It Will Stop Arbitrarily Dropping Caregivers From Program The temporary suspension comes three days after a report from NPR exposed concern from veterans that their caregivers were arbitrarily cut, despite no change in their status. Retired Sgt. Chris Kurtz wheels himself up to his front door as his wife and caretaker, Heather Kurtz, follows behind. The Department of Veterans Affairs told him last summer that he no longer needs a caregiver. The Department of Veterans Affairs announced Friday that it will stop dropping caregivers from its stipend program. 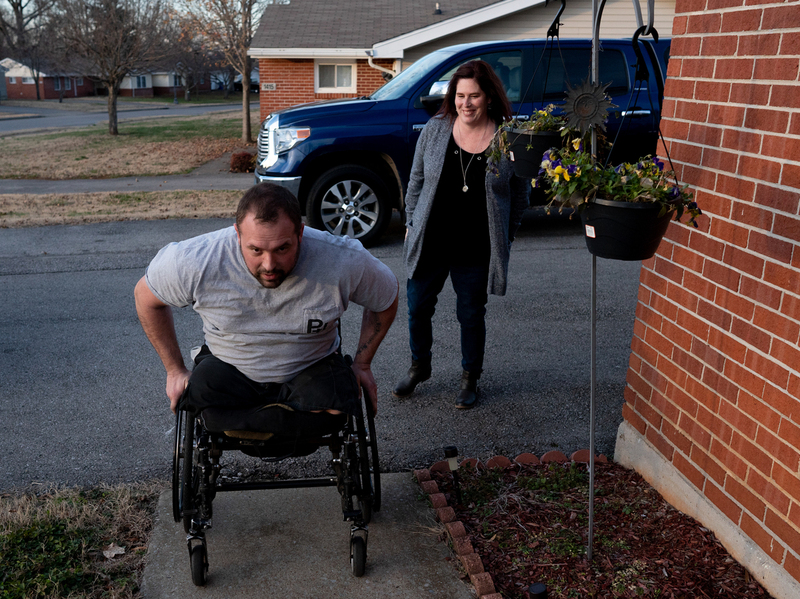 The temporary suspension comes three days after a report from NPR exposed concerns from veterans that their caregivers were arbitrarily cut, despite no change in their status. The VA became aware of "continued concerns expressed by Veterans, caregivers and advocates about inconsistent application of eligibility requirements by VA medical centers," the department said in a statement said. "It is essential that we get this right," said VA Secretary Robert Wilkie. "This affects one of our most vulnerable Veteran populations and we need to make sure we have consistency on how we process and evaluate benefit applications across VA."
The program started in 2011 to support family members of veterans who served in Iraq or Afghanistan. Caregivers receive a stipend — ranging from $660 to $2,600 per month — to provide home health care that would otherwise cost the VA millions of dollars. But as NPR reported, many VA offices have drastically cut hundreds of caregivers off their rolls in recent years — often with little explanation to the caregivers. In Charleston, S.C., the VA dropped 94 percent of its caregivers in three years. The VA calls the suspension temporary but says it will "continue to solicit feedback from external stakeholders" and is "reviewing policy changes as well as pursuing long-term legislative and regulatory changes." After a 2017 NPR report, the VA briefly stopped kicking people off the program and carried out a strategic review. But the cuts continued. The caregiver program is supposed to be growing to include veterans from World War II, Korea and the Vietnam era. But, as NPR also reported, the VA recently blew through its first information technology deadline, raising concerns about further delays. Congressional sources say the expansion could take years.